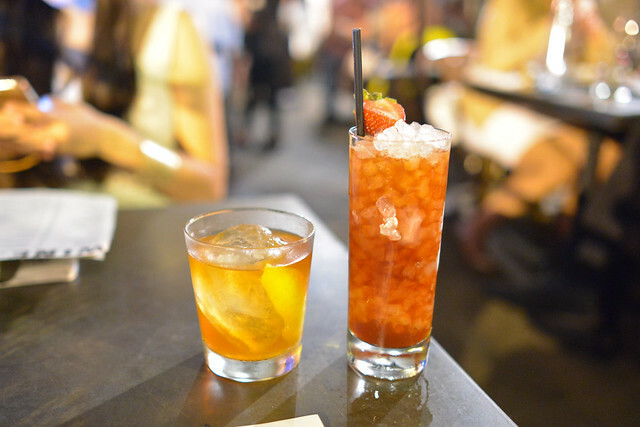 Bestia continues to be one of my favorite restaurants in the city. 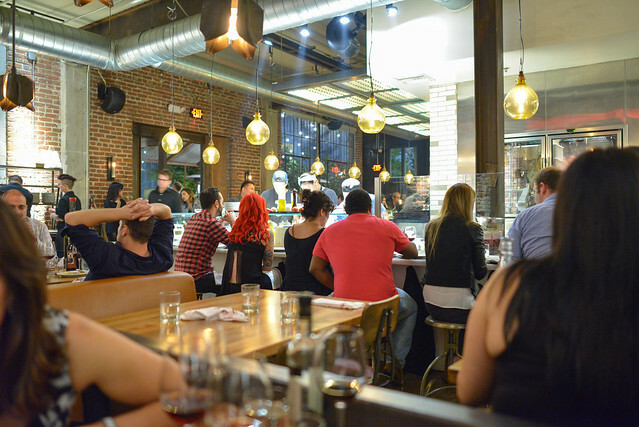 The food’s as good as ever and the restaurant continues to pack the house nightly. 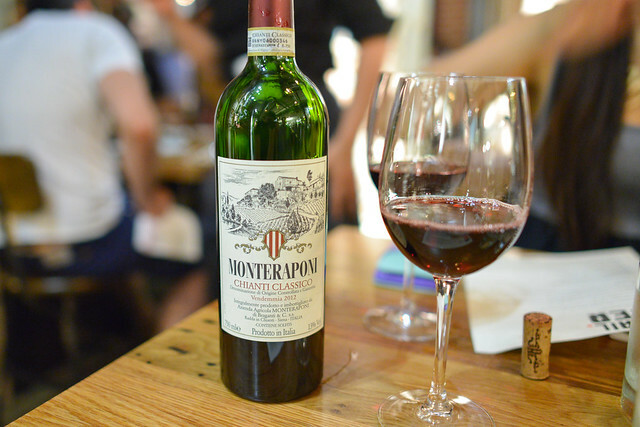 I’ve visited regularly, once every month and a half or so; this post recaps three of my most recent meals. I tend to bounce around a lot between the cocktails (a Julian Cox program) and the wines. 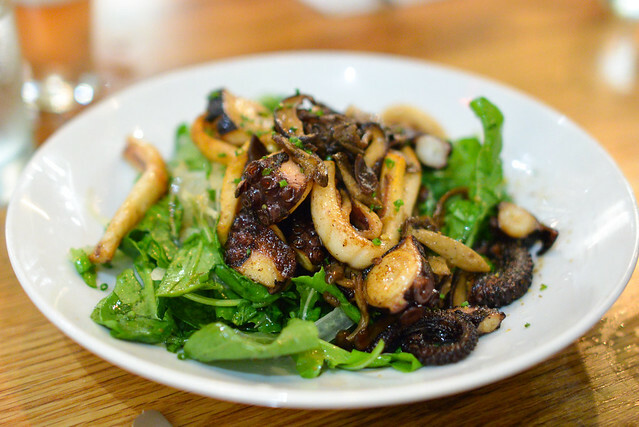 Grilled Octopus & Calamari. arugula. mushrooms. fennel. aged balsamic. chili lemon vinaigrette. The octopus was slightly overcooked this night, leaving it on the chewier side. Squid was more tender, complemented by bright greens. 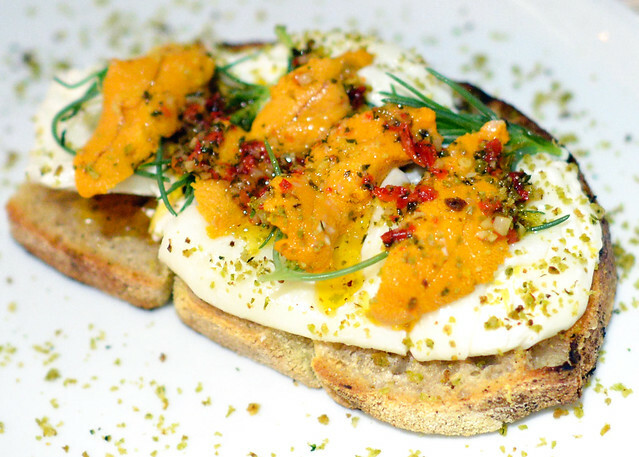 Creamy burrata and sea urchin were luscious bites. This was one of the heavier of the small plates with the thick crostino, but worth the stomach room for an uni and burrata lover. Mussels & Clams. housemade spicy ‘nduja sausage. fennel seed. preserved orange. grilled bread. 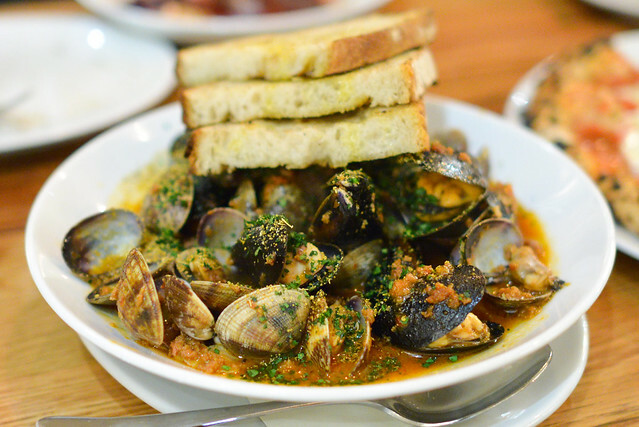 While the mussels and clams were good, the sauce was outstanding. Slightly spicy and utterly savory with a nice fennel undertone, it really complemented the shellfish. Crusty bread was an ideal way to soak up the excess liquid. Pan-Fried Ciccioli. pickled fennel. creme fraiche. fennel pollen. wild fennel flowers. Ciccioli, compressed pieces of fatty pork, was crunchy and rich with pork flavor. 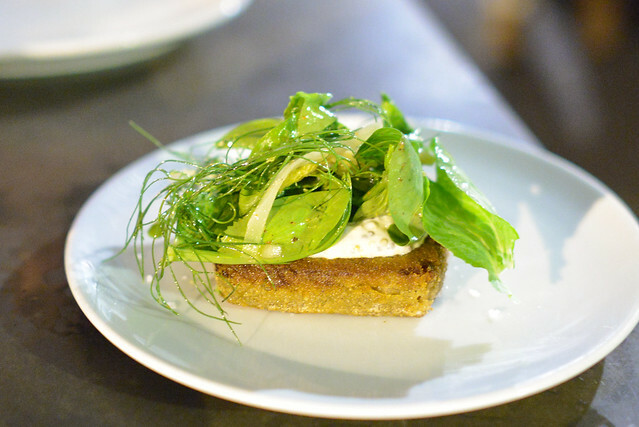 Creme fraiche and pickled fennel did a good job of countering the richness with some bright, acidic flavors. Always a favorite – the gizzards are both crispy and tender with a ton of flavor. Endives and beets provide some fresh flavors to balance it out. 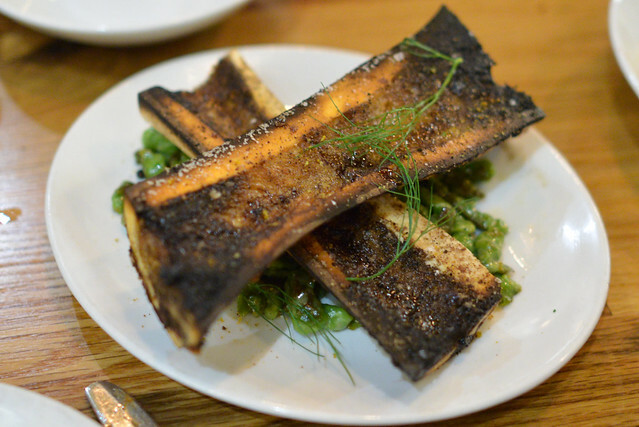 Roasted Marrow Bone. spinach gnocchetti. crispy breadcrumbs. aged balsamic. 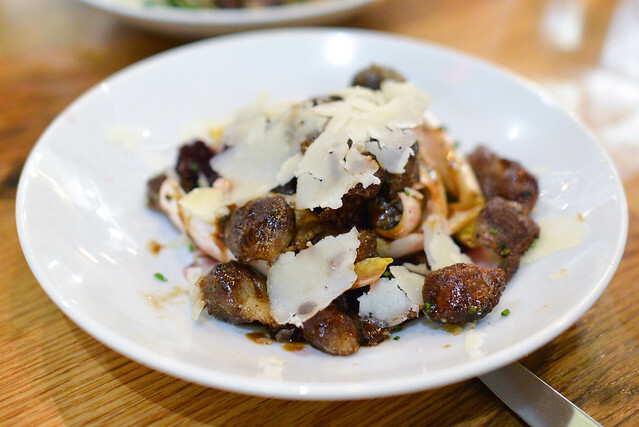 The marrow is scooped out and mixed with the gnocchetti to make some rich, flavorful bites. 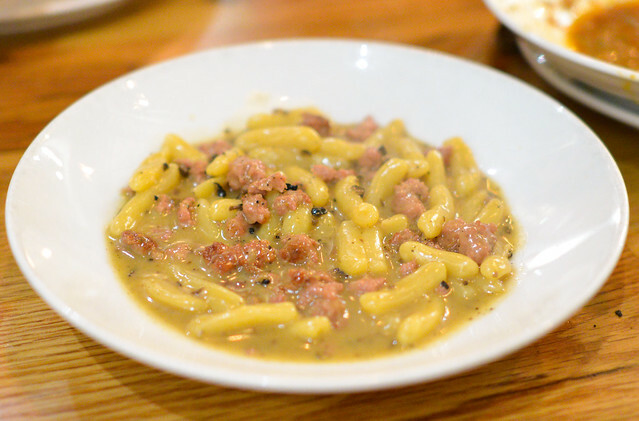 The pasta maintained its chewy texture even while bathed in the oily goodness. 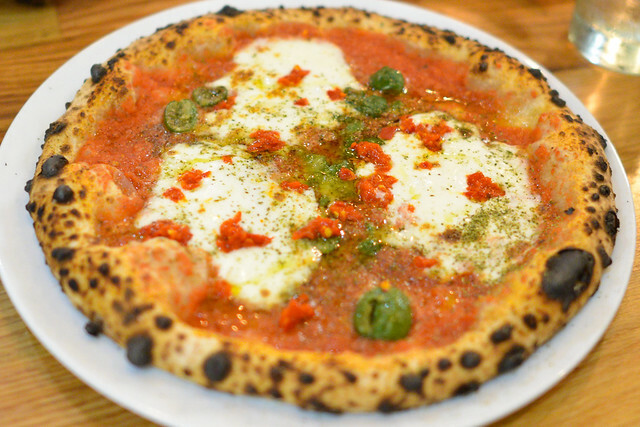 Burrata Pizza. san marzano tomatoes. castelvetrano olives. oregano. fermented chilies. Burrata melted beautifully here, oozing all over the pie. The tomatoes were delicious, particularly atop the chewy, charred crust. Spaghetti Rustichella. sea urchin. squid ink bottarga. garlic. calabrian chilies. breadcrumbs. Pici. house leavened semolina. lamb ragu. saffron. capra sarda. breadcrumbs. parsley. Strozzapreti Nero di Seppia. squid ink. lobster. clams. romanesco broccoli. chilies. lemon zest. 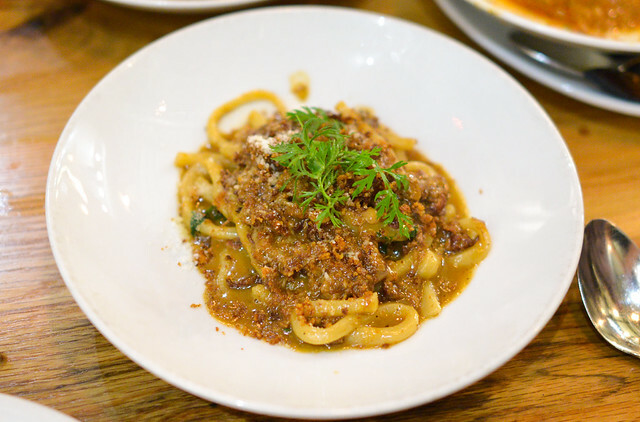 Pastas are always excellent and one of the restaurant’s strong points. 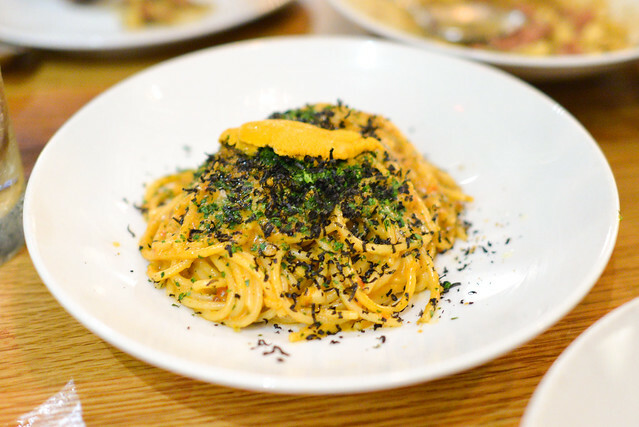 The spaghetti rustichella tends to be a favorite, full of sea flavor and topped with sea urchin. 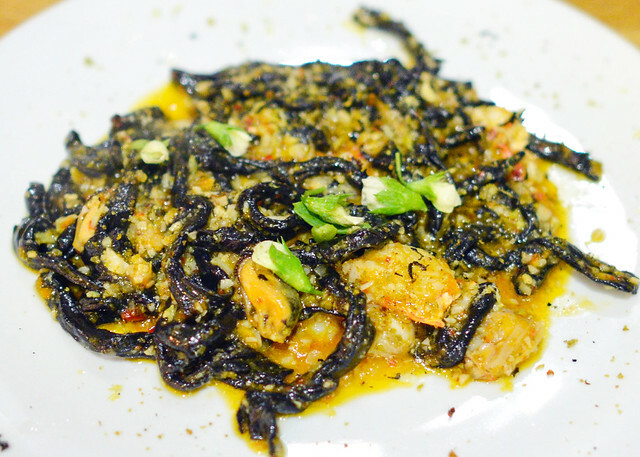 The squid ink strozzapreti had similar flavors based on shellfish, while the cavatelli and pici featured more earthy, meaty flavors. All were good with perfectly cooked chewy pasta. Kurobuta Pork Chop. 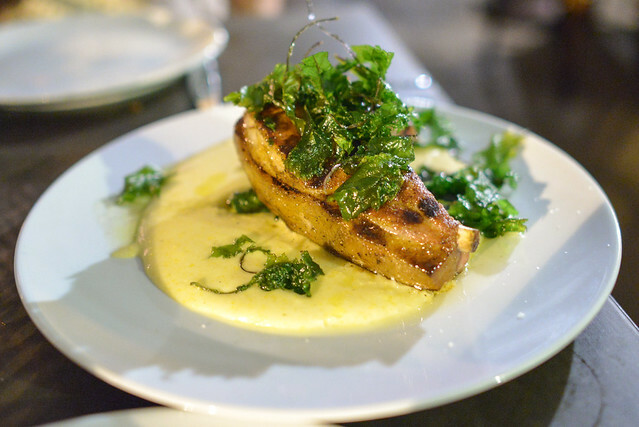 anson mills polenta. sauteed spinach. fried baby kale. Pork chop was tasty, cooked a nice medium. Silky smooth polenta and sauteed spinach were welcome accompaniments; while overall this was a good dish, it wasn’t particularly noteworthy. “Coffee & Donuts.” spiced chestnut zeppole. whipped cream. coffee ice cream. Summer Peach Crostata. frangipane. buttermilk ice cream. Desserts are pretty strong at Bestia too. 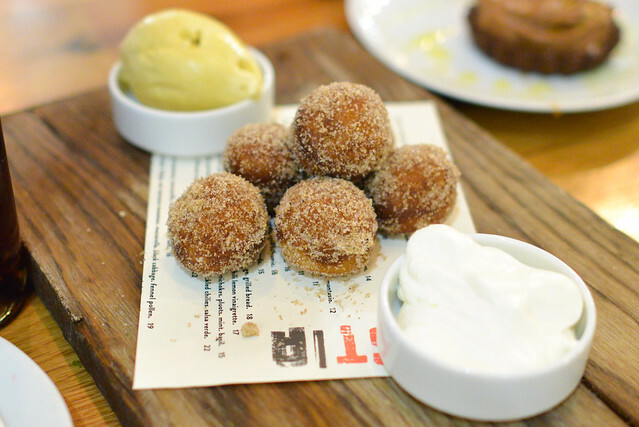 The fried ‘donuts’ served warm with ice cream and whipped cream are perfect for sharing. Love the contrast in temperatures and textures. 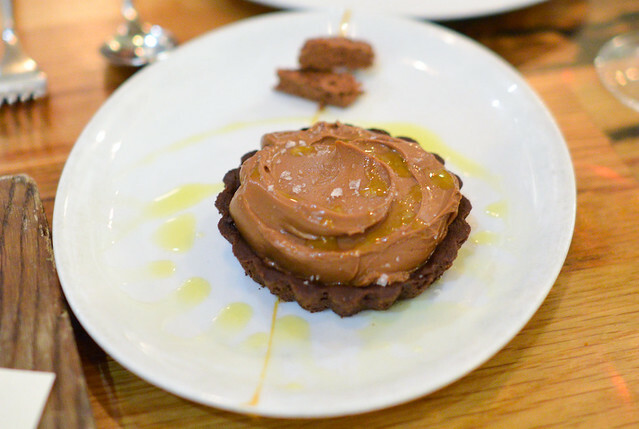 The budino tart had a great cacao crust with salted caramel and olive oil complementary flavors. 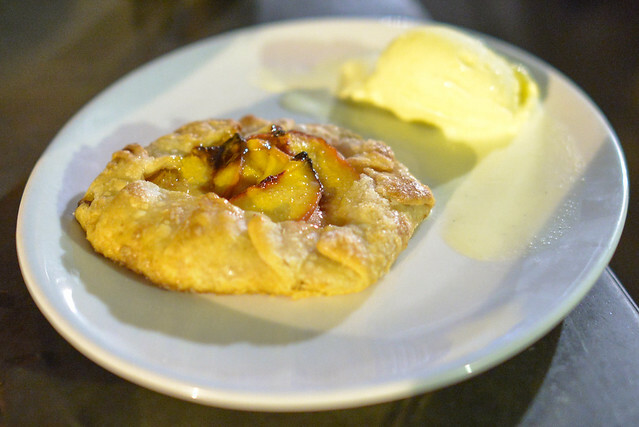 Lastly, the peach crostata, which we had in August, showed off fresh seasonal fruit in a crispy warm tart. 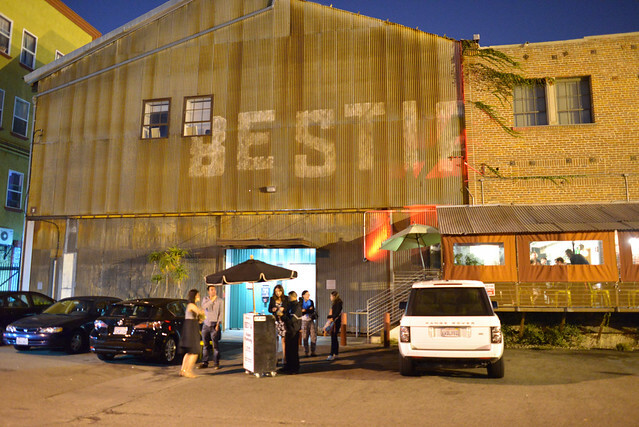 I will continue to be a regular visitor to Bestia. To me, strong points are the small plates and pastas. They’re really well executed and show off a lot of flavors. Pizzas and larger plates have been good too, but not to the same extent as the smaller plates. Plus, they involve a much larger investment in stomach room. Still, it’s hard to go wrong here. You have no excuse not too you’re local! I swear I’ve been here 6 times this year alone. Went for the first time for my birthday on Oct 1… loved it!